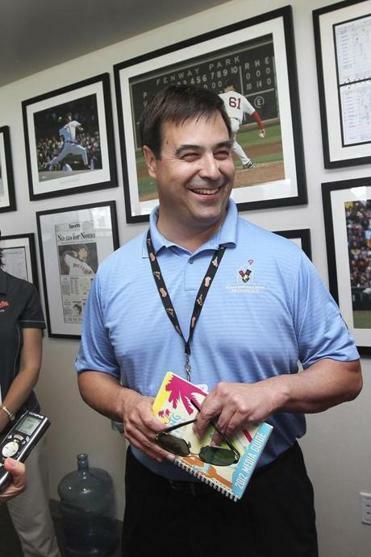 Glad to be an Oriole, Dan Duquette was back in Fort Myers - site of his firing 10 years ago. FORT MYERS, Fla. - Full circle. Ten years after. Lots of water under the Edison Bridge. Exactly one decade after he was fired by John Henry and Larry Lucchino at the Sanibel Harbour Resort, Dan Duquette returned to Fort Myers yesterday. He is the new executive vice president of baseball operations for the moribund Baltimore Orioles. He also spent a lot of time waiting for the phone to ring. Patiently. Sometimes not so patiently. Duquette wanted to get back into the game that tossed him aside back in February of 2002. The end in Boston was ugly for Duquette. The new owners got the team in December of 2001 and waited until all the papers were signed before relieving Duquette of his duties. The Duke seemed to be the last to know. He thought he was in for a promotion when the hammer fell in Sanibel. Two years later, the Red Sox were world champions. Duquette was in St. Louis on Oct. 27, 2004, when the Red Sox won the World Series. He was road tripping with his Amherst College pal (and Stockyard owner) Mark Manning. He watched with pride as the Sox dismantled the St. Louis Cardinals to win their first World Series in 86 years. He worked overtime to be generous when asked about Boy Wonder Theo, but it had to sting. Theo Epstein reaped all the credit, but Duquette built half of the 2004 champs. Duquette is the one who signed Manny Ramirez, traded for Pedro Martinez, signed Johnny Damon, found Tim Wakefield on the scrap heap, and acquired Derek Lowe and Jason Varitek in exchange for Heathcliff Slocumb. That year, with Mike Port serving as interim GM, the Sox finished out of the money. A year later, they made it all the way to the seventh game of the AL Championship Series (the Grady Game) before losing in epic fashion to the New York Yankees. That was Epstein’s first year as GM of the Red Sox. There is some symmetry in Duquette returning to the majors with the Orioles. The Duke grew up rooting for the Red Sox in Dalton, Mass., but he owes his start in baseball to former Orioles executives Bob Brown, Frank Cashen, and the late Harry Dalton. Cashen and Dalton were Oriole GMs who ushered Duquette into the life of a major league baseball executive. Duquette learned the Oriole Way at the altar of Dalton in Milwaukee. Duquette was the Boy Wonder a decade before Epstein. He was 35 when he took over as GM of the Red Sox on Jan. 27, 1994. The first manager he hired was Kevin Kennedy, a former minor league catcher with the Orioles. “The Orioles had a system for winning,’’ said Duquette. “That same system that Harry Dalton taught me in Milwaukee was the Oriole Way. “We just had Earl Weaver in town to address our major league staff, our minor league staff, and our major league players. We had an Earl Weaver seminar to go over Earl Weaver’s book and Paul Richards’s book. That was the foundation of the Orioles teams that were successful in the past. He said he’d been back to Fort Myers a few times during the 10 years he was in big league exile. He remembers Ben Cherington as a young buck in the Sox organization. “Ben always wanted to be a general manager. He’s smart, loved baseball, and has excellent instincts for player evaluation,’’ said Duquette. What did Duquette take away from his eight seasons as general manager of the Red Sox? How much personal satisfaction did he take when “his’’ team won the World Series in 2004? The real answer will remain a secret. Duquette has waited 10 long years to get back to The Show, and he is not going to blow it all up by telling us how he really feels.